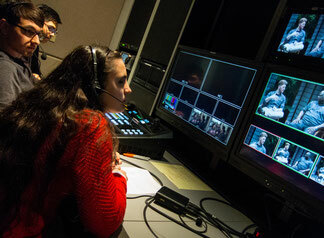 Welcome to our Advanced Digital Media Production: TV Studio Live course. During the spring 2018 semester our goal will be to produce ten half-hour talk-show format programs that reflect student, faculty and community interests. Each student will be expected to produce at least one segment for one of the shows in this series which is titled @UNI. Some of you will have the opportunity to produce more than one segment and host the show. The first four weeks of class will be spent rehearsing in the TV Studio as well as researching and developing segments. All materials for our shows will be shared on the UNI G-Drive in a manner that will be prescribed. Finished scripts for the teleprompter and rundown sheets for control room personnel for example. The shows are all here on Vimeo: https://vimeo.com/unidigitalmedia. By @UNI #3 we had pretty much hit our stride. @UNI#10 is a "best of" compilation. The segments break down into three categories. These are guests, performers, and roll-ins. (Quotes from Clara was our prerecorded roll-in ie. played back during the live show.) Your segment ideas need to contain specifics, including names, contact information and why the quest or performer will be of interest to the UNI and Cedar Falls communities. These ideas need to be e-mailed to me by 5PM Friday January 12th. Consider this to be your first assignment for this class. Fridays will become our standard deadline for assignments, including scripts and rundown sheets. The UNI Comm. Studies TV Studio is built from components provided by Ross Video, one of the biggest TV equipment sales and integration companies in the world. The company website is here. Even more important the Ross Video training modules are here. We have a Carbonite switcher and an Expression graphic work station. Another resource that we will use regarding general TV Studio operation is the School Video News on-line TV Production course.